I took a hike to one of my favorite alpine tundra areas. 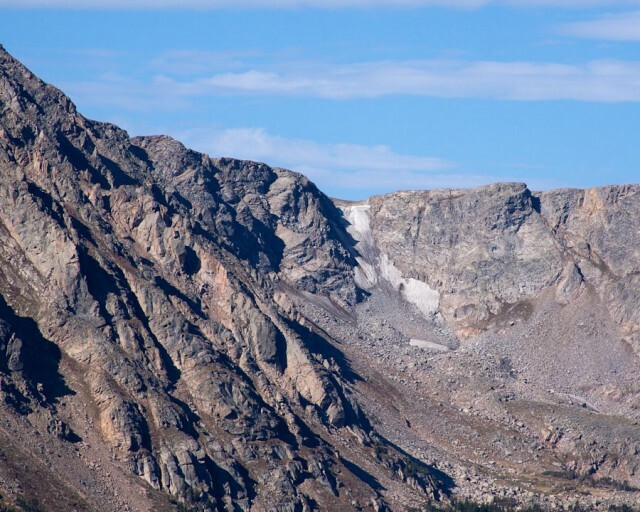 The area doesn’t have an official name, but it is within the boundaries of the Indian Peaks Wilderness area. Looking east from this unnamed 12,000 foot mountain top, the smoke from the wildfires in western Nebraska helps to differentiate the different layers of the mountain view. Normally it’s just a mass of forest and one ridge is difficult to discern from another. In the mountains, the season is transitioning from summer to fall. The aspen leaves in some areas are already in full autumn colors. It seems a week or two early. Many of the small plants in the tundra are turning rust color as well. Only a few small dirty snowfields remain on the high peaks. Usually by mid-September, these high peaks and ridges will have had several dustings of snow. As I sat on the mountain top eating a snack, I kept my camera ready for getting a good shot of a pika. In spite of years trying, I’ve never gotten a good shot. In this case, I didn’t have right lens with me. 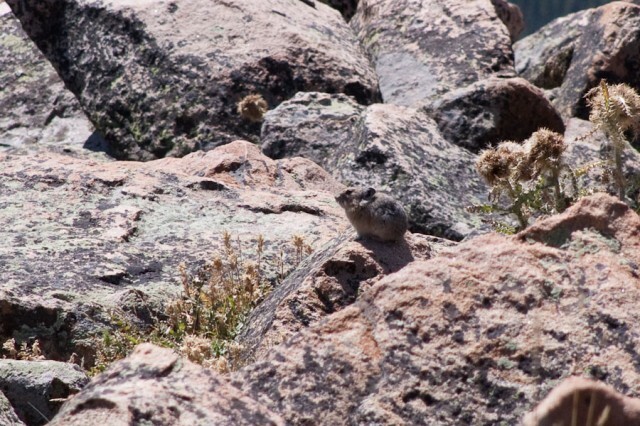 Pikas are small members of the rabbit family and make their homes in under the boulders and rocky areas above treeline. I caught something out of the corner of my eye, right below where I was sitting. This little guy, not including his tail, is about 8 – 10 inches long. His tail is about 6 inches long. I’ve never experienced a weasel this curious before. I’m glad I had my camera ready. This guy was very agile. He’d pop his head up for a second or two, then disappear into the boulders, and unexpectedly pop up again in a different place. It was entertaining to me to guess where he would show up next. For a moment I thought there were two of them because one moment he’d be on one side of me, a few seconds later, the other side. I’m grateful for auto-focus technology in cameras. I never would have gotten any photos otherwise. Here you can see the black tipped tail of the weasel. In the winter time, they turn all white except for the tip of the tail. 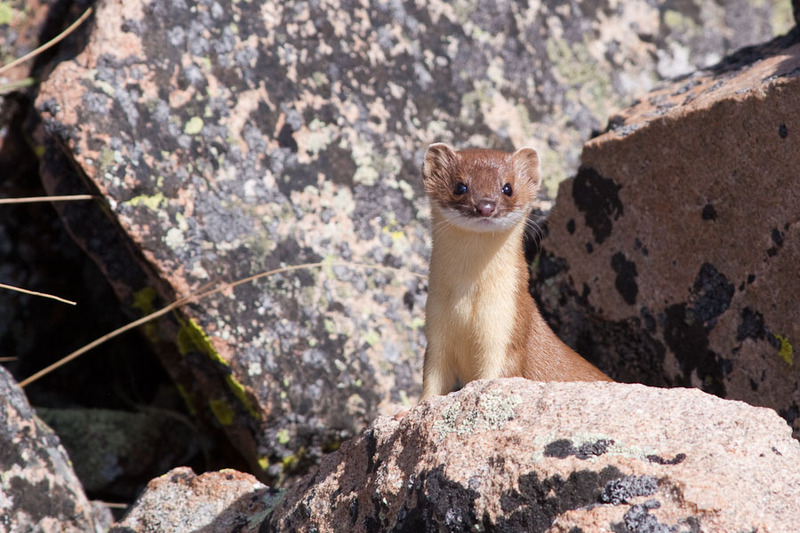 Two winters ago, I saw a white short-tailed weasel bobbing through the snow with a vole in its mouth. 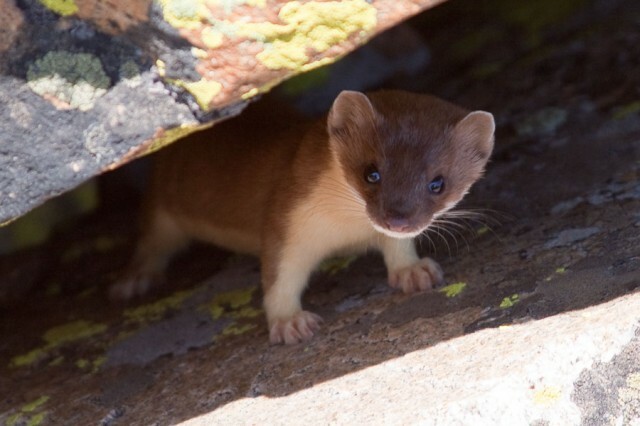 The short-tailed weasel in winter is also called an ermine. 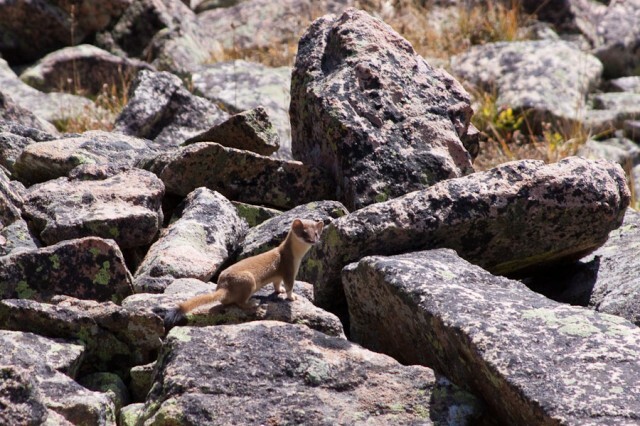 This weasel was probably hunting the pikas that were nearby. 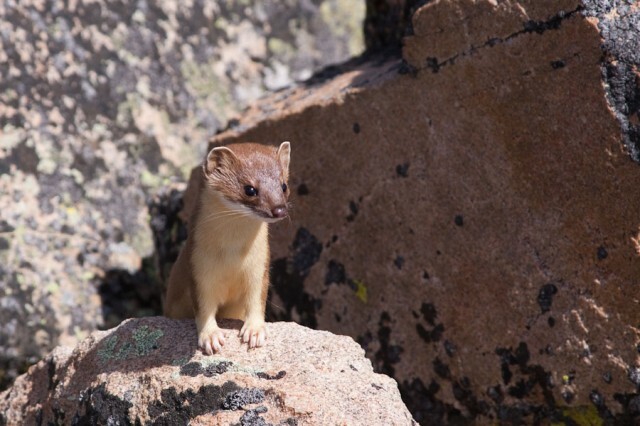 While I was hoping to get a good shot of a pika, I came away with some good shots of a weasel instead. It was a gorgeous day up on the tundra, and so rare that the wind was dead calm at that elevation. What a cute little thing!!!! I’ve never even heard of a Pika! How cute! And the weasel is too! 🙂 awww! One of these days, I’ll get a really cute photo of a pika. Great photos! I’ve never seen a weasel in the wild before. That first photo of him peeking out from under the rock is perfect–you can sense how curious and daring he must be for such a little animal. I know! He’s so close you can see my refection in his eyes. One supposition I’ve heard for the earlier color change has been because of how dry it was early on, and then the rains we’ve gotten. As good a theory as any; it’s still been pretty toasty during the day before the rains. The mornings tell me I’ll be back in jeans before long. Those are awesome photographs, as usual. I’m hoping to get up tundra at least once more before the first flakes. Maybe we can arrange an outing ;). a distant relation of my own dear ferrets…but oh-so-much-fiercer. and so cute! They have the reputation of being fierce, but a friend of mine thinks it’s just because they have to eat all of the time. Their surface area to mass ratio suggests they have to eat a lot to survive winter up in the tundra. I’ve heard so many theories about what causes the leaves to change color. I don’t think anyone knows for sure… it’s one of nature’s mysteries. Sorry to post reply here, but I really needed to thank you for iDesiccate and the replies were closed. I just scanned and removed PRIV tags from 10,000+ MP3s using your iDesiccate program and I am immensely grateful to you. Thankyou very much.